I was intrigued about this movie when I saw the poster in the coming soon section of 2 cinema websites in Indonesia. At first I thought it was another sequel to Resident Evil: The Final Chapter, but when I read it a bit more, I realized it had got nothing to do with that movie. Anyway the movie premiered in some Indonesian cinemas starting from Saturday. As I was having another weekend staycation with my wife on Saturday, I only went to the cinema today after we checked out from the hotel. My wife was having various things to do at the time, and hence I watched this movie by myself in Plaza FX. Ok, I will proceed to the movie now. Chris Redfield (voiced by Kevin Dorman) was a member of BSAA, an elite unit specializing in killing the undead/zombies. He was given the task along with special forces from another unit to capture the notorious weapons dealer named Glenn Arias (voiced by Alexander Polinsky - Charles in Charge TV series). Though the mission was not successful, Chris did manage to find out that Arias was working on a new kind of virus to create the undeads. Meanwhile, Professor Rebecca Chambers (voiced by Erin Cahill - Power Rangers Time Force TV series) was a researcher who was analyzing about the latest zombie attacks hitting some areas in United States. Due to her exemplary work, Arias has assigned his team led by a mysterious blonde woman to steal her work. During her analysis, Rebecca found something in the virus that could help find the cure. According to Chris it would require the help from the expert, Leon S. Kennedy (voiced by Matthew Mercer), a US government agent who was actually no longer interested in fighting the undeads. With the condition becoming more and more critical, all of them had to find out the way to reveal the evil plots of Arias and also to prevent it from happening, which would lead them through various obstacles of swarm of undeads. After watching this movie, I felt that this was a very entertaining one. The movie was filled with various actions of zombie-killing from the standard one on one, one against many, two against endless army and so on. The action sequences were absolutely awesome. The earlier part action was cool, but the most amazing breathtaking scenes would definitely be the climax fight. It was filled with crazy almost absurd fighting scenes which most likely could only happen if it was done in an animated movie. Now, this kind of movie seemed to be aimed for the fans of the game. It was a movie sharing the same universe as the video games Resident Evil. It was set in the time after Resident Evil 6 but prior to the events in Resident Evil 7: Biohazard. It did not have any relation to the Resident Evil live action movies with the main character of Alice (played by Milla Jovovich). 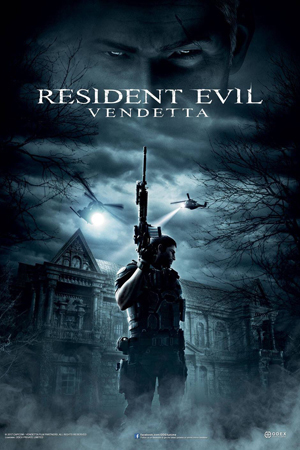 Though Chris Redfield and Leon Kennedy characters did appear in Resident Evil: Afterlife, Retribution and The Final Chapter. Reason why I said it was more targeted for the fans were the fact they did not really bother to give introductions to the 3 main characters. It was assumed that you would know them all if you have already played the game. However, for us who do not play the games at all, it was not really bothering. The main attraction of this movie was not the drama anyway (the director tried to show some drama scenes which unfortunately did not really fit into the movie nicely enough. Perhaps due to the rather plain voices characterization?). I, for one was not really disturbed with this lack of introduction and I just went along with the movie. Regarding the sound effects, it was absolutely cool. I noticed at the end credit scene that it was having a Dolby Atmos sound system. Too bad the movie did not play in one of those cinemas, so I could not enjoy it even better. Speaking about end credit scene, there was nothing at the very end. So it was not really required for you to wait until it completed. As a CG animated movie based on video game, I feel this one was better in term of the finale fight scene than another similar movie I saw few months ago Kingsglaive: Final Fantasy XV. The action sequences here felt more alive, though again, the drama part was not nicely done as it felt a bit plain. Be reminded that being a movie based on the violent game, this one is definitely not suitable for children. It was full of brutal killings, violence and blood. Ooh another thing, I believe the title of this movie suit very nicely with the story. So if you are one of those who are fans of Resident Evil game, I believed that watching this movie would definitely be really worthwhile. Now if you have not played the game, but you enjoy watching zombie killing movie, then this one is definitely an option. The CG animation is the only factor that might not appeal to general audience, since even though the animation of the people were very lifelike, there were still stiffness on some of the movements especially during conversations. But they were not felt at all during the actions. Anyway, I was entertained by this movie and I hope you are too (in case you decide to watch it). This movie premiered in Indonesia on the same date as in Japan. So I am not really sure how successful this movie would be at the time I write this post. Perhaps I would update that sometime later.